The calcareous skeletal deposits of little sea creatures have formed Belize's 180 mile long barrier reef. It grows a few miles offshore. Between the coast and reef lay numerous cayes (pronounced 'keys) which are postage stamp islands. 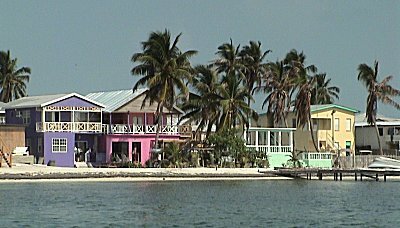 From the dock in Belize City, any visitor can hop on a speedboat taxi and ride out to one of these little islands. 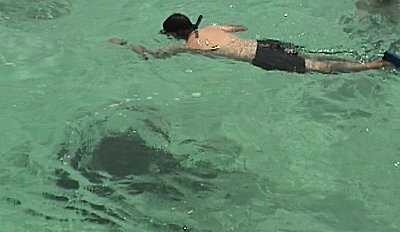 Along the way watch the bottom through shallow and clear water, the depth averages 15 feet to the cayes and reef beyond. We ride a boat taxi to Ambergris, the country's largest caye, population 2000. This island may be the largest caye (25 miles long) yet it's only 5 blocks wide at some spots. Standing in the middle of town you can see both sides of the island. 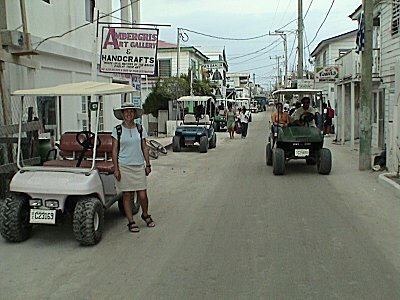 Golf carts serve as the main form of transport. Ever touch a skate? They feel like buttered rubber.